Ring in the New Year with Mari, LIVE on WFMT Radio's national NYE broadcast! Looking for a great soundtrack to your New Year's Eve? Tune into the national broadcast of WFMT Radio Chicago's "Midnight Special" with Rich Warren, where Mari is thrilled to be the first instrumental act ever featured on their special New Year's broadcast (yes, that's right...in the many years of this radio event, they have never had a non-singing act on the roster. Wow, what an honor!)! She'll be performing alongside three other celebrated folks artists -- Tim Grimm, Joe Jencks and SONiA -- for an evening full of diverse, joyous folk music, and you can tune in via radio or internet to celebrate with with them! Hope you can join us for this musical New Year's Eve! It will be a blast! Of course, Mari will also be starting off the New Year with a flurry of shows in the Northeast, both with her trio and with her exciting new duo project with 3-time World Accordion Champion Cory Pesaturo. Check out the calendar page to find out where to catch them in person! Happy (almost) New Year, everyone! Ah -- fall has arrived! It's Mari's favorite season, and this one in particular will be chock-full of music all over the country as she and the band will visit 15 (count 'em, 15!) states before the holiday season: Tennessee, Massachusetts, New York, Pennsylvania, Wisconsin, Iowa, Illinois, Texas, North Carolina, Virginia, Vermont, New Jersey, New Hampshire, California, and Rhode Island (and even visiting some of these more than once! )...are any of these YOUR home base?? Check out the tour calendar and see where you might be able to catch Mari and her trio for an evening of toe-tapping dance music! Though they wander far (and near?) from home this fall, it's seeing YOU -- our musical family -- that is the best part of touring, so come on out and join in the fun! See you out there! Teaching: Scottish fiddle, Canadian fiddle, Twin fiddling, Comping, and more! Mari says: "A truly wonderful, family-friendly camp with classes on many instruments and many styles, including percussive dance! I will be on faculty teaching Scottish fiddling, as well as performing and teaching afternoon workshops on various topics. Check out the link to read more of what's in store for this amazing week!" Mari says: "I'm thrilled to join a group of world-renowned faculty for a week of all things Celtic! Scottish, Irish, Cape Breton -- Fiddles, guitars, mandolins, flutes, drums, song, and dance -- all ages, all levels, and family-friendly. Wow! Not to be missed!" Mari says: "You want Scottish fiddling? THIS camp is Scottish fiddling! A week in the beautiful Blue Ridge Mountains where you can explore everything possible to do on a fiddle with a Scottish 'accent'. Small group classes, a fiddle orchestra, and even private lessons (the only camp I know that offers them!) -- and of course, tons of jamming!" Mari would love to see you at any of these camps! All three currently still have limited space available, so click on your favorite link above and reserve your space now. See you at camp! Happy New Year to you all! 2018 is already off to an exciting start -- the Mid-Atlantic Songwriting Competition just named Mari the Gold prize winner of Instrumental compositions for her tune set "The Lost Bells" (featured on her album "FLIGHT")! 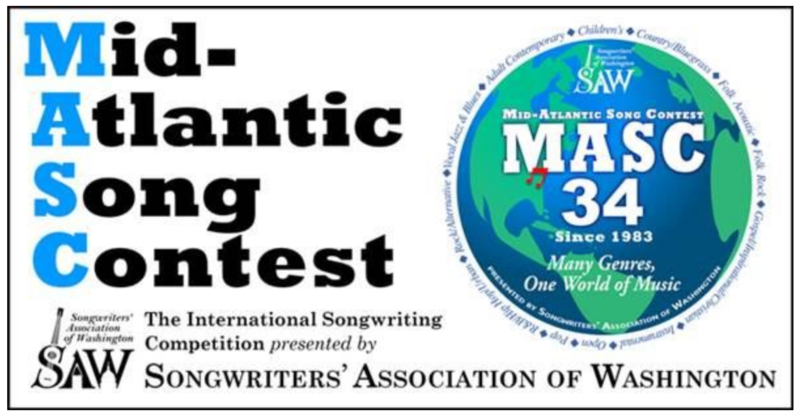 It's a huge honor, especially amidst so many beautiful compositions submitted by artists from all over the world, and Mari is thrilled to be a part of this joyous celebration of music and songwriting (or, as she would say, song CATCHING!). Check out the MASC website to see a complete list of winners and information about the upcoming Awards Gala, where Mari will be performing along with other top prize-winners! If that's not enough excitement, the 2018 tour season kicks off with visits to NJ, DC, OH, MD, TX and more! Come catch Mari and her trio for some toe-tapping dance music to keep you warm during the winter months; new shows are posted on the tour calendar page so you know where to find us. See you out there! Mari is incredibly honored to have been selected as a Formal Showcase Artist for both the North East (NERFA) and the Mid West (FARM) regional Folk Alliance International conferences! Held in Stanford CT and Iowa City IA, respectively, Mari and her trio will be performing throughout both conferences, showcasing their unique and energetic blend of dance music from around the world. If you're in those areas or attending either conference, come say hello and catch some rockin' dance tunes! Mari would love to see you there! Of course, in addition to the showcase appearances, Mari and the gang will have concerts all over the place, sharing their favorite dance tunes with you! Check out the Calendar to see where you can catch them this fall...and don't forget to bring your dancing shoes! Tune in to hear Mari LIVE on WFMT Chicago's "FolkStage!" Greetings from Chicago, where Mari and her trio are looking forward to performing on WFMT Chicago's "Folkstage" this coming Saturday! It will be an especially fun show, featuring dance music from all over the world...and all of you are cordially invited tune in and join them LIVE via www.wfmt.com! That's right: the whole show will broadcast live on the radio and by internet, and it's going to be a great time! Music starts at 9:00 p.m. Eastern / 8:00 p.m. Central Time (and other time zones too, of course, via the magic of the internet). Click here for all the show info! After Chicago, Mari and the gang's spring adventures will continue in the Mid-Atlantic, then on to the West Coast and back to New England. To see where to catch them live, check out the Calendar page and find a show near you! You can also catch Mari at the various fiddle camps she'll be teaching at this summer, including the Jink and Diddle School of Scottish Fiddling and the Acadia Trad School. See you out there! 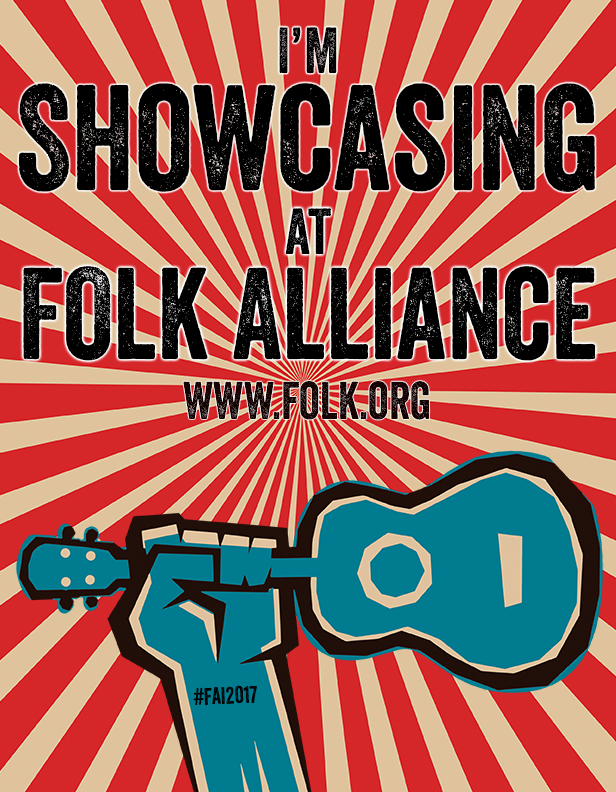 In just a couple weeks, Mari and her trio are headed to the Folk Alliance International conference in Kansas City, where she is honored to be featured as one of this year's Official Showcase Artists! They will be performing throughout the weekend, so if you're in Kansas City or know someone at the conference, come say hello and catch some rockin' dance tunes! See you out there! A quick hello and Happy New Year from Mari and the gang! We hope your year is starting off fresh and healthy, with lots of good music on the soundtrack! Mari is very excited about the upcoming touring season, in which she'll get to visit many of you in New England, Kansas City, North Carolina, Chicago, the West Coast, and more, starting with the season opener at the Blackstone River Theater on Saturday January 14th. You can see all the upcoming shows on the Calendar page, where we'll be adding even more 2017 dates in the coming weeks. And if you'd like a very special treat to watch right here, right now, check out the video of the Glenfiddich Fiddle Celebration in Scotland, an amazing once-in-a-lifetime concert where Mari performed alongside 17 other world Scottish fiddle champions! World-class fiddling all around, and a joy to watch! That's all for now...Looking forward to a great year of music with all of you! "Festival of Champions" webcast from Scotland & the upcoming "Tour de Time Zones"
Welcome everyone to the brand new website! Hats off to wonderful web designer Adam Agee of Creative Studio Labs, who has built such a fun and vibrant online home for Mari and all her adventures! Feel free to have a poke around and see everything she's up to, including upcoming shows, new stories from the press, pictures from recent adventures, the full compliment of "Tune of the Month" videos, videos from shows, and more! Check back often for updates -- plenty of fresh adventures and rockin' dance music to come! Enjoy! It seems like this is "National Celtic Month", at least for Mari! She just returned from the Highland and Islands Music and Dance Festival in Oban, Scotland, where she was excited to be the first American fiddler ever invited to perform at the festival...and, as you can see, came home with quite a few honors! Additionally, Mari is featured as "the Fiddler" in this month's issue of Celtic Life International magazine, in a lovely piece talking about her musical heritage, performing adventures, practice philosophies, and hopes for the future of Celtic music. Check out the issue to read the whole thing for yourself! 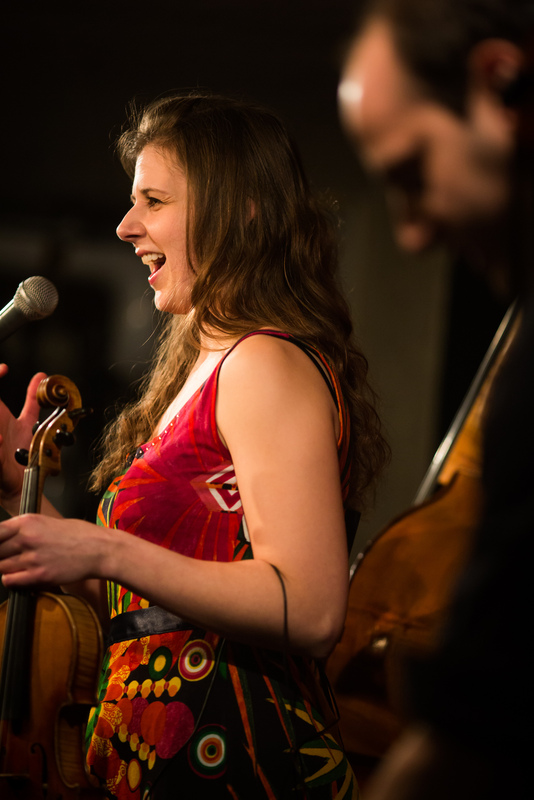 Spring is almost here, and with it a host of great upcoming fiddle adventures for Mari and the band! As always, details can be found on the Calendar page, but highlights include a trip to Scotland to perform at the Highland and Islands Music and Dance Festival in April, an appearance at the Blackstone River Theater Solstice Fest in June, and teaching at the Jink and Diddle School of Scottish Fiddling in July. Come join in the fun! We’ll see you out there! 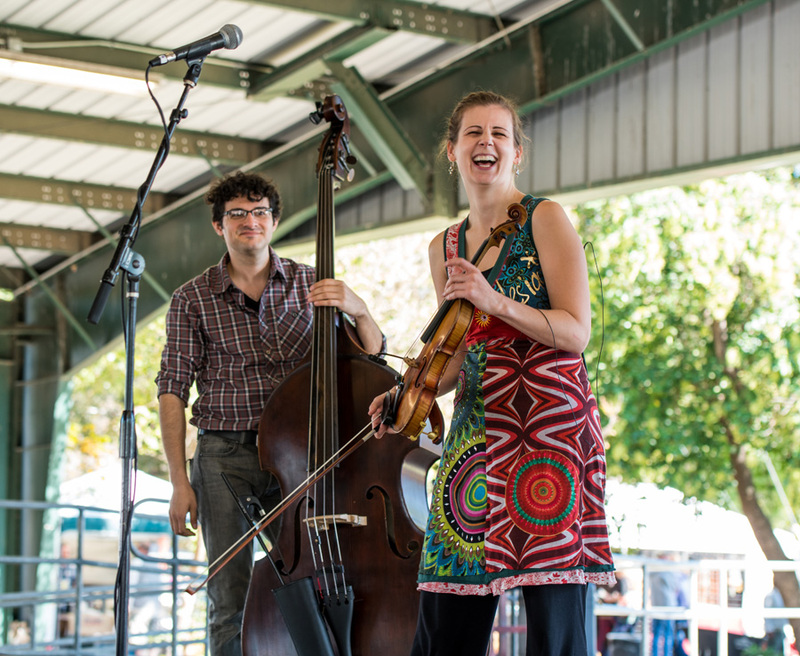 After a fall full of adventures on the road, Mari and her band are excited to kick off 2016 with two action-packed tours through the Northeast, including stops in Maine (including Portland’s Acoustic Artisans, The Acadia Trad School, The Kittery Dance Hall), Massachusetts (Boston Celtic Music Festival), Connecticut (Fire in the Kitchen and The Outer Space), New York (The Upper Jay Arts Center), and Rhode Island (The Blackstone River Theater), and more! Check out the detailed tour schedule so you can find where to catch them out on the road! Mari will be teaching various workshops along the way, and is all set for shows full of new high-energy dance music. She’s looking forward to seeing you out there! Big news to starts off an exciting fall of music! 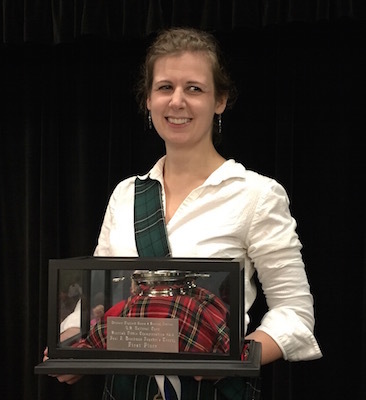 Just this weekend, Mari was chosen as the 2015 U.S. National Scottish Fiddle Championships, making her a 2-time champion of this prestigious competition! Mari had a great time performing at the Edinboro Highland Games and Scottish Festival, and is deeply honored by the award. Here she is pictured with the Founders Quaich, the traditional Scottish trophy, just after the results were announced. Mari’s very excited about her upcoming fall performances, which will take her through the Northeast (including her only home-town Boston show before 2016! ), Scotland, Texas, the West Coast and more. Highlights include the Austin Celtic Festival, the Glenfiddich Fiddle Championships in Scotland, a special showcase at the NorthEast Regional Folk Alliance Conference, and return visits to favorite venues in Southern California. Check out Mari’s schedule for all the dates and details so you can come join her for some awesome dance music on the road! She’ll be looking for you out there…! Happy May everyone! We had a whirlwind of awesome during our New England shows in April and May: sold out shows in Boston, Connecticut, and Maine; amazing special guests including World Accordion Champion Cory Pesaturo and innovative ‘cellist Eugene Friesen; and the unveiling of new favorite tunes and arrangements. There was much dancing in the aisles. And in the streets leaving the concerts. The spring adventures will now continue on the West Coast as Mari returns to California! Check out the calendar page to see where you can join us for concerts and workshops! And for anyone wanting to study Scottish-style fiddling with Mari, she will be on faculty at the renowned Jink and Diddle School of Scottish Fiddling, July 26-August 2. 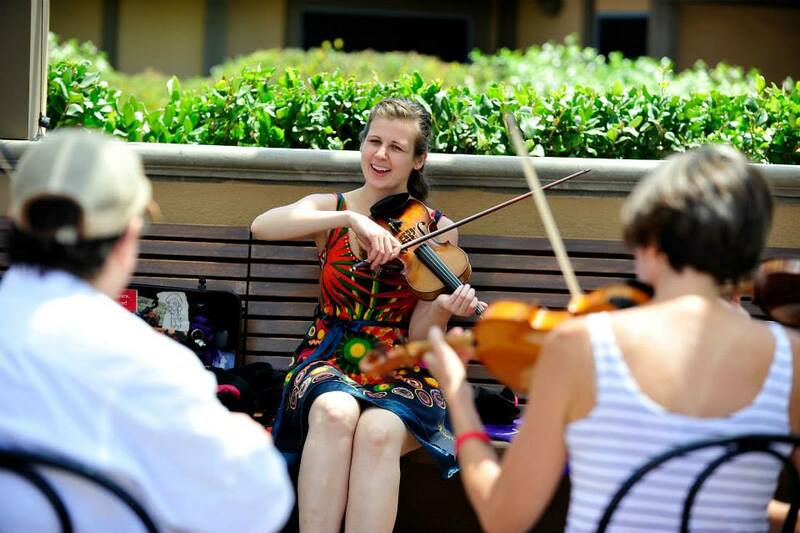 In addition to learning tunes and exploring accompanimental ideas for fiddlers, Mari will be leading a special workshop on competition-style Scottish playing with lots of chances to play for feedback, perfect stylistic interpretations, and develop performance sets. Jink registrations are still being accepted now — sign up ASAP to secure your spot! Dogsled Tours and Looking Ahead to Spring in New England! Greetings to all our friends in music! It’s been an eventful start to 2015 — Mari and her band just returned from a snowy tour of Maine presented by Phill McIntyre of New England Celtic Arts. Despite the cold weather and snow drifts over 7 feet (wow! ), folks packed in for sold-out concerts across the state, from Portland to Farmington to Ellsworth, and even as far north as Calais right on the Canadian boarder! The photo here shows the band enjoying their last night up in Calais. Now Mari and the gang are looking forward to spring, with shows in Boston and Connecticut coming up, including playing the season finale of the Standing Room Only concert series with special guest, World Accordion Champion Cory Pesaturo! Check out Mari’s calendar page to see where you can catch them live. If you’d like to come study some fiddle tunes with Mari, she will be teaching at the Julian Family Fiddle Camp in Julian California from April 8-12. Spots are still available. See you out there! 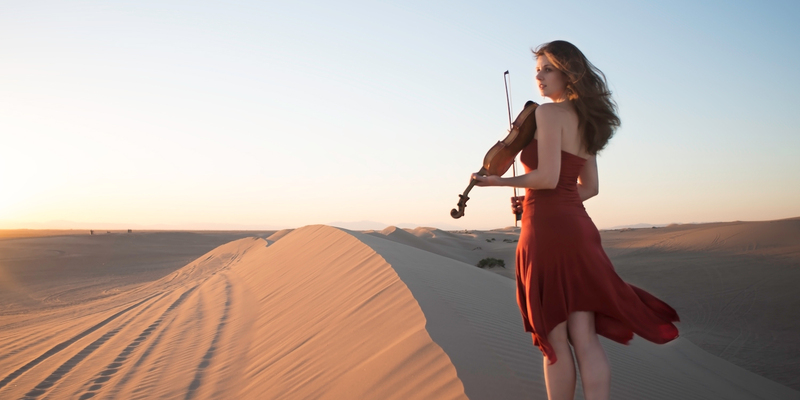 If you want to see Mari’s fiddle passion in action, check out the schedule page, where new 2015 shows were just announced, and more coming soon! This spring, Mari will be touring in New England and the West Coast, giving workshops, and teaching at several fiddle camps. Stay tuned for details! - “FLIGHT" CDs - $15 each. HOLIDAY SPECIAL: $12 each if ordering 10 or more CD's! 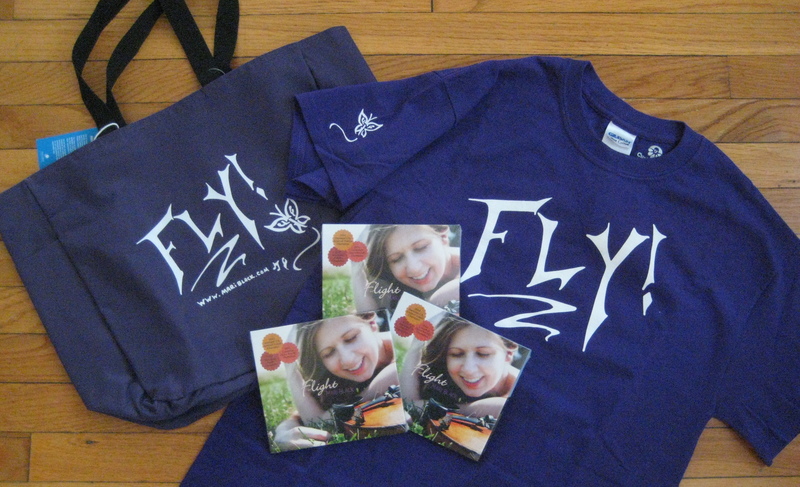 - “FLY" T-shirts (available in small, medium, large) - $20 each. HOLIDAY SPECIAL: $16 each if ordering 3 or more shirts! - “FLY" Tote Bags - $20 each. HOLIDAY SPECIAL: $16 each if ordering 3 or more bags! 3. Your order: Tell us what you want, how many (make sure you include sizes for t-shirts), and any signatures or special dedications you want on each item. Signatures/dedications are available on everything. We'll respond quickly to confirm your order and shipping address (or addressES, if you would like us to send items directly to your gift-receivers!). We accept checks and PayPal, and we'll get your FLIGHT GEAR right off to you! We recommend ordering before December 15th to guarantee arrival before Christmas. 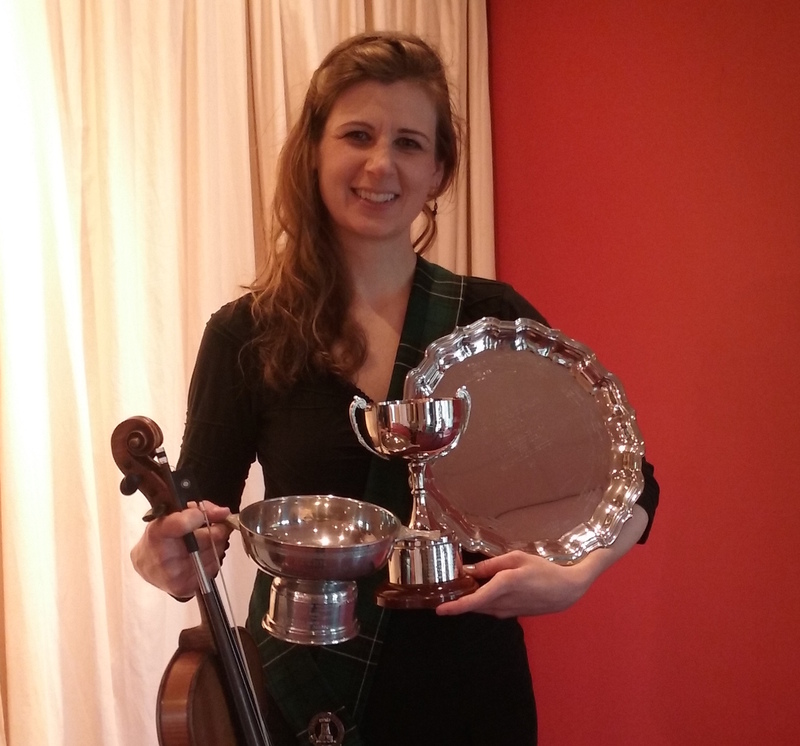 Mari Crowned the 2014 Glenfiddich Fiddle Champion of Scotland! Big news from Scotland, where Mari has just been named the 2014 winner of the world-renowned Glenfiddich Fiddle Championship! To win the invitation-only competition, Mari performed a full program of tunes by revered Scottish composers to a packed hall at the famed Blair Castle. Mari is only the 4th American ever invited to compete in the history of the prestigious competition, and is honored to join the ranks of celebrated fiddlers who have held the title before her. 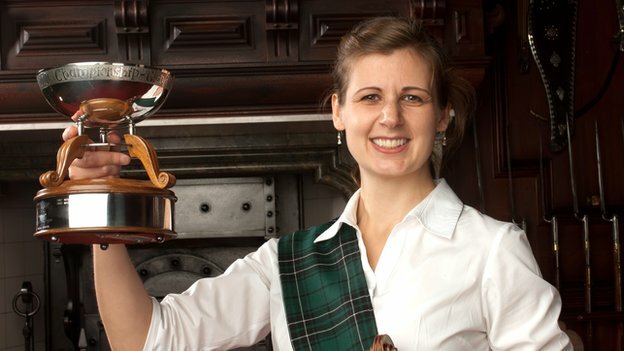 Here she is pictured with the revered Glenfiddich quaich, moments after winning the championship. Her name will be added to the trophy, which is displayed year-round in Blair castle under the portrait of Neil Gow, the father of Scottish fiddling. Now Mari gets a few hours to enjoy Scotland before heading back on the road for concerts. Her next stop is the West Coast, and includes concerts, dances, and workshops in San Diego, Los Angeles, and Portland OR. Check all her exact show dates on the schedule page to find out where you can come see her in person! What an exciting few months we have coming up! Mari is off on the first legs of her fall travels, which will take her through New England, Texas, and the West Coast, all before Thanksgiving rolls around. 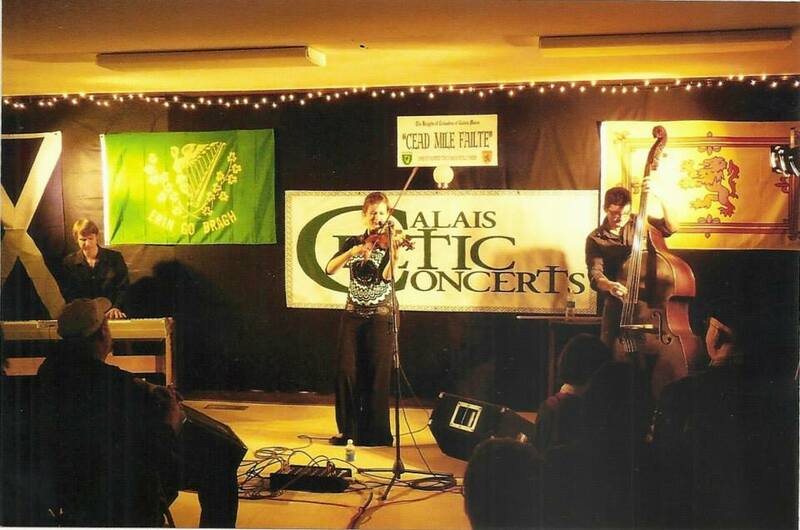 Events include Mari’s eclectic multistyle shows with her World Fiddle Ensemble, appearances at various Celtic festivals and Highland Games, playing for dances of various styles, fiddle workshops on a variety of topics, and even a ground-breaking interdisciplinary circus. Sound like fun? 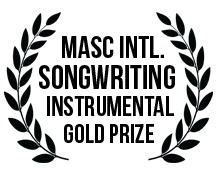 Check out the schedule page to find a show near you! Stay tuned for more updates as the adventures unfold! Until then…happy fiddling’! Now Mari is off to the West Coast for her summer California tour! If you’re in Southern California, check out her San Diego and L.A. shows with her World Fiddle Ensemble! They’ll be watching for you out there, so be sure to come say hello and share a few tunes! Here’s Your Chance…Learn Tunes from Mari! Hello everyone! Mari is very excited to announce a new project: a “Tune of the Month” video series, in which she will pick, perform, and teach some of her favorite tunes just for you! The videos will start with a fun, candid performance of the tune, then Mari will break the tune down, teaching it slowly and explaining all the techniques, stylistic idioms, and ornaments you need to be able to play it yourself. The idea is that whenever you cross paths with Mari out on the road, you will have some fun, unusual tunes to play together. You can also enjoy them with your own musical friends at home, teach them to your students, watch them with your friends, etc. However you most like to share the joy of music! Tickets for tonight's release show Club Passim are SOLD OUT, but thanks to some pretty spiffy technology, you can still join Mari and her band from anywhere in the world on a live webcast via Concert Window! Just click that link and you can watch the entire show on your computer, in your living room (in your PJs?) or wherever you happen to be! The party starts at 8:00 p.m. Eastern Standard Time. Don't miss it! As if that's not enough excitement for one day, be sure to check out Mari's spring show schedule, which includes more CD celebrations, a tour to Brazil, and a very special show with phenomenal Irish fiddler Liz Carroll in Boston, all coming up in the next few weeks! It's going to be a great season, so be sure to go find Mari out there on the road and say hi. She'll be looking for you! After an incredibly successful Indiegogo campaign (114% funded - wow! 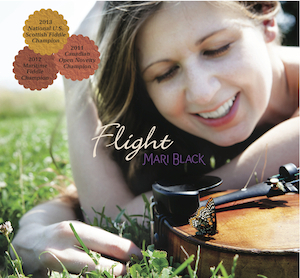 ), Mari has just put the very last finishing touches on her new solo album, "Flight"! Huge thanks to everyone who contributed, shared, and generally helped in the campaign -- it wouldn't have worked without you guys! Now comes the best news of all: the album is done, and the CD RELEASE PARTY will be on Tuesday, April 29th, 8:00 p.m. at Club Passim in Cambridge! Featuring the core gang from the CD, this will be a truly awesome show as Mari and her favorite musician friends officially unveil "Flight" to the world. This is a show not to be missed! In other news, Mari just returned from an awesome West Coast tour with her World Fiddle Ensemble, and is ready to head into an exciting spring and summer of performances. New tour dates are being announced, so be sure to keep an eye on the schedule page to see when Mari and her band will be in your area! You can also "Like" Mari on Facebook for show announcements, pictures, road stories, and all sorts of other candid updates. See you out there! SUCH EXCITING NEWS this week! At last, Mari's new solo album is DONE -- all the tracks have been recorded and mixed, and the whole thing sounds absolutely amazing. Now, Mari needs YOUR help to FINISH the project! Check out the Indiegogo Campaign where she is raising funds and excitement for the last steps of getting this CD out into your hands and ears and dancing shoes. There are lots of ways to support this project, including contributing to the campaign (in return for some pretty spiffy Flight-themed rewards!) and helping spread the word to all your fiddle-loving friends! Thanks for all your support! Tours and Kilts and Albums, oh my! What an exciting few weeks it has been! Mari returned from the West Coast after a triumphant and adventure-ridden tour with her tango quartet, Orquesta Sin Trabajo, where highlights included headlining The West Coast Tango Marathon, teaching some amazing "Not Another Musicality" workshops (including this one at the famed CELLspace in San Francisco), eating massive amounts of Tootsie rolls (long story…), and even an impromptu baggage claim tango performance, caught on film at the San Jose airport. Whew, what a trip! For more highlights, pictures, and notes from the road, be sure to follow Mari on Facebook, where she's always posting about what's going on. The rest of the fall includes various performances in kilts and, of course, lots of studio time as Mari enters the final stages of completing her solo album, "Flight"! Follow Facebook for her updates directly from the studio, and stay tuned here for all the information about the spring CD release! Fall has almost arrived, and Mari is getting ready to hit the road with her tango quartet, Orquesta Sin Trabajo! The group will be touring in California for the next few weeks, so be sure to check the schedule and catch them at their best on the West Coast! Introducing the 2013 National Scottish Fiddle Champion! Some very exciting news to kick off what is shaping up to be an amazing fall: Mari took a break from the recording studio long enough to play at the Edinboro Highland Games and Scottish Festival, where she was crowned the 2013 U.S. National Scottish Fiddle Champion! Needless to say, Mari is deeply honored and thrilled to join the ranks of outstanding fiddlers who have held the title before her. 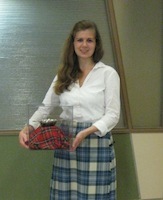 Here she is pictured with the Founders Quaich, a traditional Scottish trophy, just after receiving the award. Returning to Boston, Mari will spend the upcoming weeks mixing her new album, "Flight", before heading out for a tour of the West Coast with her tango quartet, Orquesta Sin Trabajo. Lots of adventure and great music on the horizon, so be sure to watch the schedule page to catch Mari on the road, and follow her on Facebook to keep up with all her fall adventures. See y'all out there! Time flies when you're having fun! It has been a whirlwind summer, full of unbelievably exciting developments. Mari has been hard at work finishing up her debut solo album, which began with a week of magical recording with pianist Jake Charron and 'cellist Mike Block back in May. Since then, the CD has grown to include even more amazing musicians, including Canadian accordion and clogging master Sabin Jacques (of Raz de Maree), All-Ireland champion whistle player Tyler Duncan, world and jazz percussionist Michael Shimmin, mighty bass player Jesse Williams, and more. It's truly an astounding cast of artists, and Mari is so honored to have each of them on the CD, which is scheduled to be released this spring. Of course, we all know that Mari's ability to wait patiently to share music is…well, nonexistent. In that spirit, here is a small preview of what's coming on the album, some special footage from a live show with Mike and Jake during that first week of recording in Boston. Enjoy, and stay tuned for more previews and details about the album release soon! And here we are! Next week, Mari heads back into the recording studio to create her debut solo album! She will be joined by dazzling Canadian pianist Jake Charron and fabulous rockin' cellist Mike Block, as well as other special guests, playing selections from all different fiddle styles and even a bunch of Mari's own original tunes. It's a very exciting project that is nearly 15 years in the making, and Mari can't wait to share it with everyone! Stay tuned for news about the project progress, release date, and more! Brand New Tango CD with Orquesta Sin Trabajo! Exciting news! Mari and her tango ensemble, Orquesta Sin Trabajo, have just finished recording their debut album, "¡Viva Tango!" The CD includes the group's fresh, energetic arrangements of their favorite classic tangoes, and Mari can't wait to share it with you! To kick everything off, there will be an awesome CD Release Party on Friday, April 19th at the New England Tango Academy, and everyone is invited to come help celebrate! The party starts at 9:00 with dancing, and Orquesta Sin Trabajo will perform a special live set from 10 - 11. Check out Mari's Schedule page for more details about this event and the other Orquesta Sin Trabajo performances coming up this spring. As if this isn't enough excitement, Mari's summer schedule is rapidly filling up with fun appearances in the fiddle and contra dance world, and she is already busy working on her next album, this time a fiddle recording featuring some of her favorite musicians, tunes, and original compositions. Stay tuned for more details on all these projects, and make sure to come say hello to Mari somewhere along the road! Winter has flown by in New England and beyond! Mari has just returned from the American String Teachers' Association (ASTA) national conference, where she greatly enjoyed catching up with old friends, meeting new ones, and presenting her doctoral research on multistyle music in colleges. Other highlights included watching a new group of fantastic young players perform in the Eclectic Strings Festival, an ASTA event that is near and dear to Mari's heart since she too grew up playing in it (Mari was an award-winner in 2005 and 2007, and is still close with many of her fellow cohort members). 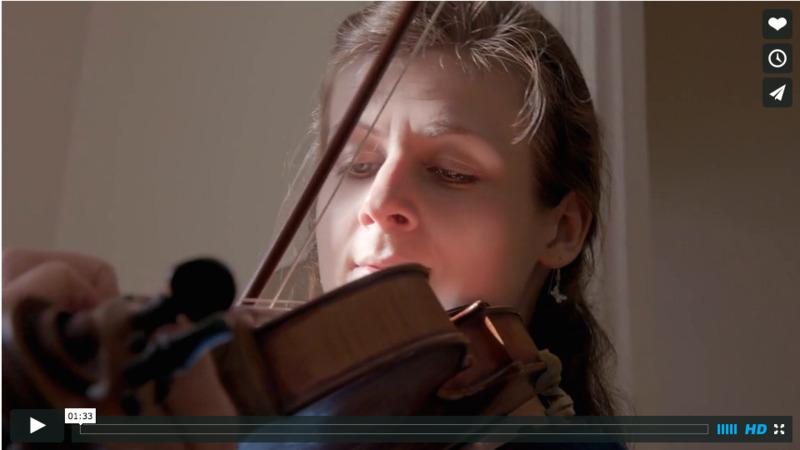 If you are a young string player in any genre, Mari highly recommends you check it out! Now back in Boston, Mari will be spending the rest of the month in the recording studio with her tango ensemble, Orquesta Sin Trabajo! The group has been putting together a diverse, energetic debut album, and Mari is looking forward to getting it into the recording studio and watching it come to life! Make sure you sign up for the Newsletter to keep up with the latest news about the album release, subsequent performances, and all Mari's other projects. See you on the other side! Happy autumn, everyone! It has been a great summer, and Mari is very excited to start a busy fall, full of interesting projects. It seems that the theme of the season is DANCE. Mari is busy performing at tango festivals with her group, Orquesta Sin Trabajo, and will be giving several of her "Not Another Musicality" Workshops for tango dancers along the way. A great deal of her highland games fiddling time has been spent with dancers, and--of course--she is working hard on her own Canadian step dancing, which will be making it’s way into her solo shows very soon. There certainly can’t be a better way to kick off Mari’s first year as "Dr. Black" (At last--no more toting pounds of research papers on the road!). Check out the Schedule to see where you can catch Mari on the road and join in the fun! And hey, speaking of exciting kick off’s, just look at this spiffy new website! Many thanks to fantastic web designer Henry Finkelstein, who has created lots of neat corners to explore. In particular, make sure to check out the new videos, pictures, tunes, and of course sign up for the Newsletter for exclusive news, stories, and notes directly from Mari. Catch you all soon! Introducing ... "Dr. Black" ... ?! Unbelievable! Mari Black is now "Dr. Mari Black"!-- But it is unlikely she will answer to that name in person, so maybe don't try. Columbia University Commencement means the completion of Mari's dissertation hibernation, and the recommencement of her full-time musicing! Keep an eye on the Calendar and projects pages for lots of new developments as Mari's summer and fall schedules fill up, and watch for her on the road, where she looks forward to traveling without extra pounds of research notes and reference books. For those who are interested, Mari's dissertation is on the college-going experiences of multistyle string players, and focuses on how different types of college programs can help these eclectic musicians on their way to successful performing careers. If you would like to read (or skim) it, contact Mari. Copies will be available in a few weeks! In the midst of getting ready for her dissertation defense in four weeks (yikes! ), Mari was very excited to return to Tango Paradiso in Medford, MA with her tango group, Orquesta Sin Trabajo and her unique Not Another Musicality Workshop for tango dancers. In addition to an active (read: perhaps slightly wild) class on phrasing by Mari and a typically mischievous and adventurous dance set by Orquesta Sin Trabajo, the Orquesta played for a special performance by Toronto's amazing Bryant Lopez and Faye Lavin. These tango projects are really taking off, so watch the Calendar page to see where they go next and catch the fun live for yourself! Happy holidays to all! Mari is spending her holiday season deeply involved in field research for her dissertation, but that never stops her from also enjoying some live playing projects! A couple weeks ago, Mari was the guest violin soloist for the Candlelight Christmas Celebration in Wakefield, MA, where she reprised the Vivaldi Winter concerto that she did with many of the same wonderful musicians at the Mentors and Muses Gala with Mark O'Connor in Jordan Hall a couple of years ago. A packed concert hall spent a frigid evening listening to Vivaldi's musical images of winter and other seasonal favorites. Next week, Mari will be teaching one of her Not Another Musicality Workshops for tango dancers at Boston's Blue Milonga, hosted by the fantastic Hsueh-tze Lee. Come join the fun! Happy fall everyone! It has been a delightfully busy few weeks for Mari, with lots of playing, guest lectures, and workshop appearances. She spent an amazing weekend at Yale University performing with Willie Ruff and the Whole Drum Truth, and giving a guest lecture about the connections between dancers and musicians in different folk traditions for the Interdisciplinary Seminar on Rhythm. After that, it was off to Virginia for a brief appearance at the Richmond Highland Games and some time with special new Scottish Fiddle mentor Dr. John Turner, an amazing fiddler who every Celtic fiddle fan should know about. In between these adventures, Mari has been giving very successful fiddle workshops in New England, and had the Boston-area debut of her unique "Not Another Musicality" Workshop, designed to help Argentine Tango dancers deepen their knowledge and connection to the music they dance to. There will be both more fiddle and tango workshops coming up soon, so watch the Calendar page to come join in! Live Webstream from Yale with The Whole Drum Truth, TONIGHT! It doesn't feel like fall yet, but the fall fiddle season has begun nonetheless! In between working on field research for her doctoral dissertation on multistyle string players in formal college programs, Mari has been enjoying Scottish fiddle appearances at various Highland Games--somehow fiddling in a kilt makes it even more fun! Stay tuned for more fall concert and workshop announcements via the Calendar page, or just sign up for the Newsletter and those announcements will find you! Greetings all, and welcome to Mari's news feed! Here, you can catch up on all her latest adventures and events, which certainly can pile up fast!  Mari has just returned from a full summer of playing and teaching in Canada, where she had many great musical adventures and even won the Canadian Novelty Fiddle Championship--the 2nd U.S. Fiddler ever to capture the title. Click here to watch her show-stopping routine. If you like that performance, check out more videos of Mari, or even better, watch the Calendar page to see when you can catch her live!